2019 is here and with it comes the urge to start fresh. There is no better time to get your startup ready for the big time than at the start of the year. You’re filled with ambitions and aspirations that you want to see through. With the kickoff of a new year, you’re sure to have the drive to make it all work. But with the energy you’ve got now, you need to put some serious thought into how to go about your startup. If you set the beginning steps right, with Sparkfactor’s help, you’re certain to make 2019 your year. Design works hand in hand with marketing, it’s a way to project a strong image of your startup out there. Your logo should not only be sleek, but easy to remember. We’ve established other tips to deliver your design before. A sharp and eye-catching design is a great way to start out your 2019, as many businesses will also be starting in the new year, you want to find a way to stand out from the crowd. Sparkfactor can assist by adding personal touches to your established designs, or help you create entirely new ones that fit your business or company. We specialize in branding, identity design and advertising both ad and logo design, but also can stretch your ideas to fit in just about any space, both online and outdoor. Our team at Sparkfactor can also help promote your design across various platforms, ensuring that you are spread far and wide. The first thing to consider when working on your startup is just how you’ll gain people’s attention. SEO, or Search Engine Optimization, is how search engines (such as google or bing) rank websites on their platforms. Usually these are based on keywords people put into the search bar, and the more those words show up within your business’ website, the more hits you’ll get. It’s also important not just for gaining clicks, but to know how SEO works in order to see how search engines view your website. Your first goal for your startup should be how the outside world will view your website, what searches they pull in, and whether there are some things you could change to get a higher ranking. Successful SEO makes for successful websites. At Sparkfactor, we use a variety of tools to heighten your website’s SEO, such as Google Search Console and Hubspot’s Website Grader. But we also add a personal touch, of people in house to further optimize SEO beyond just what the tools can do. Your business and, more importantly, your business’ information is your own. Unfortunately, the internet is still a place where a lot of unsafe malware is running about. If you want your startup to have security from leaked information (or in the future, your customer’s information) then it’s best to consider how to fight malware before it infects. There are many kinds of malware across the internet, from viruses that infect advertisements to Trojan horses that hide their true intentions behind the good things they do. These are all varied and all rather dangerous, protecting your business’ WordPress or other website accounts can come at an important cost. While Sparkfactor is a digital agency that specializes in marketing, we still pass along important information to keep your website safe. Dreamhost’s Dreamshield program is one we often recommend to startups, as it helps clean out websites of malware and other anti-virus programs. Marketing, as we’ve said before is absolutely crucial to the success of your startup. Having a strong marketing start to 2019 will not only boost your interaction with customers, but it will boost your confidence too. Marketing can come in many different forms; video ads, banner ads, ads on Facebook etc. When considering what platform you want your startup to advertise on, be sure to do your homework on which type will best suit your needs. Marketing also ties in very closely with SEO, as a more optimized marketing strategy for SEO will rank your website higher and be easier to find. For example, if you want to ‘pull’ more people to your site through valuable content (video content, blogs, giveaways or deals etc), you can use an inbound marketing strategy. At Sparkfactor, this is our bread and butter, we will help you manage your marketing in an easy to understand and effective way. With a free consultation on things like inbound marketing, we can elevate you from good to great. All of the things stated above tie in to our last key point; reputation. In essence, even if you have a fantastic start to 2019 and you check off all of the things on this list, you still have to find a way to get staying power. A ‘flash in the pan’ scenario is the last thing you need if you want to make 2019 your year for your business. You want to find ways to both maximize your growth and to keep people coming back for more, then you’ll need rally up your reputation. For example, blogging is an excellent start, it establishes a key point of contact between you and your audience. You’re able to come across in a much friendlier way, as well as entertain and inform your customers about upcoming features or additions to your company. Blogging isn’t the only way, of course, but it’s certainly an effective one. The start of a new year is both exciting and terrifying for many people, and it can be hard to throw off the dust of 2018. But, we here at Sparkfactor are excited for the new challenges 2019 will bring, along with all of the new startups like you who will need some help navigating. The world of online marketing and website design can be a scary one, but we’re here to lift you up to the heights you want to see. 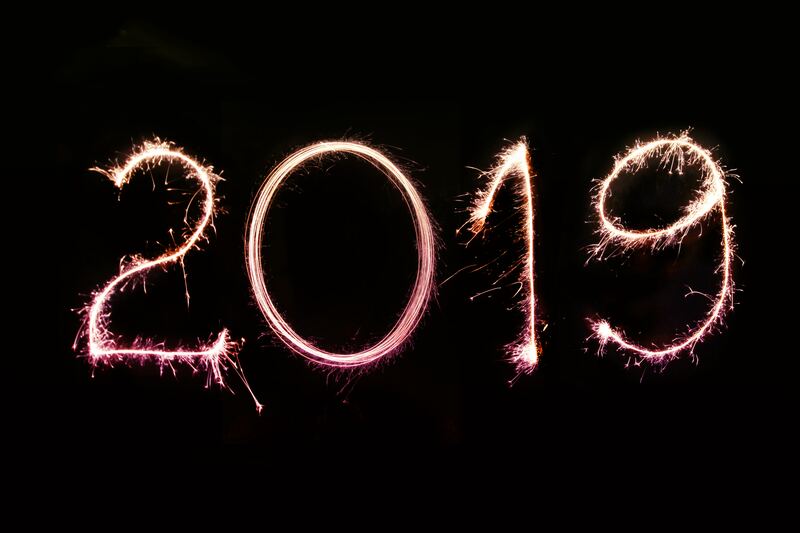 From myself and us at Sparkfactor, here’s to a wonderfully productive and amazing 2019!